Starspawn picks up a while after the events of Skinwalkers (I’m not totally clear on the elapsed time, but I’m assuming a couple of years). Jendara Eriksdottir has settled into life in the island village of Sorind with her son Kran and her husband Vorrin (the brother of her deceased former husband), working as traders from their ship the Milady. Their new life is shattered when a tsunami hits the island, destroying their home (and the homes of many in the village), and a mysterious new island rises out of the ocean nearby. In the hopes of being able to rebuild their home, Jendara and Vorrin gather their crew together and go to seek their fortune on the newly risen land, not realising that it isn’t entirely uninhabited… I won’t say too much more, since I don’t want to spoil anything, but from this point on it’s a fast-paced and action packed adventure full of foul creatures, evil beings from other dimensions, and the titular starspawn itself. Honestly, most of my thoughts from my review of Skinwalkers hold true for the sequel. The characters are still one of the best parts of the novel. That said, the secondary characters have been given more development this time around, which I’m very happy about. Jendara still gets the majority of the spotlight, since she’s the main character, but there’s a lot of time devoted to her relationships with other characters, and it gives a really good feel for those characters. I particularly enjoyed the family dynamic between Jendara, Kran and Vorrin. Kran is still desperate to prove himself, but he’s also become more headstrong and willing to push back against Jendara’s attempts to protect him. Vorrin is a loving husband, but he and Jendara clash on more than one occasion regarding their current situation, and what to do about Kran. Other highlights are Tam and Glayn, a male human-male gnome couple (at least I think they’re a couple, and if they’re not, then my head cannon says they are anyway); Zuna, the competent but standoffish (with Jendara at least) first mate of the Milady; and Sarni, a former thief that Jendara rescued and made part of the crew, resulting in her idolising Jendara and trying to be just like her. Each character has their own quirks and flaws, and none of them feel like a Generic Fantasy Character #10. Much like Skinwalkers, this is a far grittier novel than you may expect out of an RPG tie-in novel. Jendara and her crew aren’t magic users, so they’re relying on their wits, skills, weapons, and not a small amount of luck to get them through the trials ahead of them. Their opponents on the other hand… well, there’s no reason they can’t have magic, either as innate spell-like abilities, or as actual spell casting ability. But it’s not flashy, and is used in a pragmatic way, as a tool to accomplish their goals, as opposed to the usual high magic adventures (see Dave Gross’ Varian and Radovan novels for example). Additionally, the physical violence is more in your face than in a lot of the Pathfinder Tales novels. As I said about the previous book, it’s not a problem for me (quite the opposite really, I find it a nice change), but I can understand that it might put some readers off. Overall I’d say it’s a little less brutal than Skinwalkers, but it has a few moments that really make up for it, including one particularly harrowing scene that, as well as being vividly described, hits on a pretty severe phobia for me, resulting in some genuine shivers of horror. Just to be clear, I’m not saying this is horribly graphic. It’s no A Song of Ice and Fire or The First Law. It’s violent, but not gratuitously so, and it’s in service of the story, conveying the seriousness of the situation the characters find themselves in. As an aside, there was one moment with magic that got a pretty big laugh out of me. At one stage, a single healing potion is used, with a bit of back and forth quipping about whether or not they’re only for “helpless assholes”. The reason this caught my attention is that I specifically made mention of the fact that there were no healing potions in sight when I reviewed Skinwalkers back in 2014. I doubt the scene had anything to do with the fact that I’d called it out, but it certainly had me chuckling. At the risk of giving away some minor spoilers (feel free to skip this paragraph), I have to say I was really happy to see some of my favourite Mythos creatures show up. The Denizens of Leng (which you may know as the Men of Leng) and the Leng Spiders are fascinating to me for some reason, though the spiders do give me nightmares… normal spiders are bad enough, the thought of gigantic purple spiders with magical abilities is high-octane nightmare fuel. The descriptions for them are fantastic, really giving the feeling that something is “wrong” about them, even when they haven’t been completely revealed yet. I really liked the use of Moon-Beasts as well, though Pathfinder’s version of them is significantly altered from their original inspiration. They worked well in this context though. It’s interesting to note that my main concern with Skinwalkers, that I was able to see the twist coming from quite early on, isn’t really a problem here. Not because the twist is better concealed, I just didn’t really feel that there actually was a major plot twist this time. That’s not to say that everything is straight forward. There are lots of sharp turns and unexpected moments in the fine detail of the plot, and that’s a good thing. What I mean is that the overall story doesn’t really have a big moment that turns everything on its head. Rather, it feels like an archetypal Lovecraftian horror story, following the classic formula of “people explore ancient city, discover thing that man was not meant to know”, though being Pathfinder, obviously it doesn’t go too deep into the usual outcome of “and then they went insane due to the horror of it all”, opting instead for the heroes, while being traumatised by the events, being big damn heroes nonetheless. But what else do you expect from a heroic fantasy novel? Anyway, this isn’t a bad thing, in fact I think the story actually works better for it. Although I know where it’s going, given that the book is called Starspawn, and actually features one of the damn things on the cover, it’s the journey to get to that big finale that really matters, and that journey is a lot of fun. Without spoiling anything, I also loved the ending, because while things can’t end in true cosmic horror story fashion, there’s a clear and definite nod to the fact that there really are some things out there that are beyond stopping, and that it’s just a matter of time until the “stars are right” and things really go to hell. 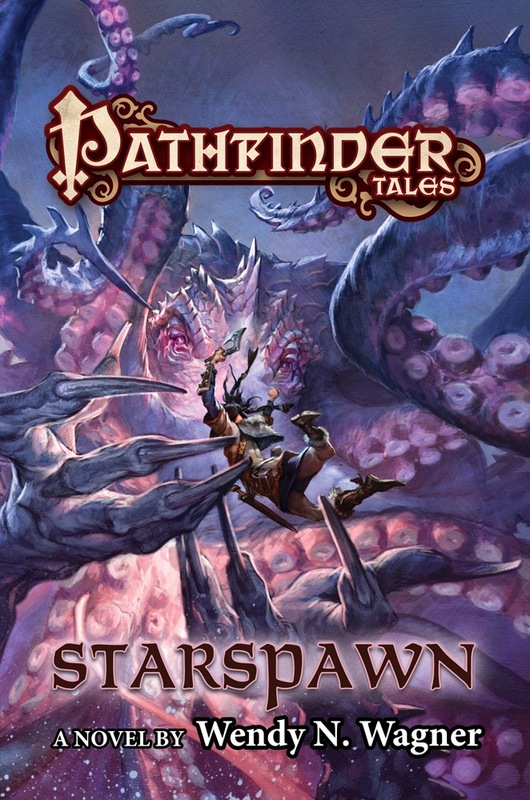 So to sum it up… Starspawn is everything I could have wanted out of a sequel to Skinwalkers and more. It pulled me in right from the start, and didn’t let go. In fact I started reading it on a Saturday morning while having breakfast at one of my favourite cafes, then came home, sat down and didn’t get off the couch until I’d finished it that afternoon. Wendy’s literary style is, as always, engrossing and a joy to read, with smooth, easily followed combat, and character interactions that feel natural. There were a couple of surprising emotional sucker punches in there as well… I’ll admit to tearing up at one or two scenes. If I had to pick a favourite moment, Jendara’s encounter with the starspawn would be it. It really captured the horror that Jendara was facing, but the fact that she didn’t completely fall to pieces still felt believable, which I think is a testament to how well the character is written. Honestly, I can’t think of anything I didn’t like about this story. It does exactly what it sets out to do, in a well written and stylish manner, and with no wasted words. Rather than saying it’s short, I’d instead say that it’s exactly as long as it needs to be. Which leads to the vital question… Would I recommend Starspawn? Long answer: Hell yes! So long as you’re not a purist when it comes to Lovecraft inspired stories, and you don’t have a problem with a relatively low magic fantasy novel with somewhat graphic violence. Like it’s predecessor, it’s not trying to be anything more than an exciting adventure in the Pathfinder RPG setting, and once again, it succeeds effortlessly. While The Redemption Engine is still my favourite entry in the series, Starspawn is close on its heels, sitting in good company with Forge of Ashes. I’m already looking forward to whatever Wendy N. Wagner’s next project may be, because whether or not it’s a Pathfinder Tales novel or something completely unrelated, I’m sure it’s going to be amazing. I’d like to give Wendy a huge thanks for sending me a copy of this book to review. I love the Pathfinder Tales novels, but don’t get to read that many of them these days due to having had to cancel my subscription due to the drop in the Aussie dollar and a few other factors. So it was lovely to be able to dip my toes back into that world, if only for a little while. Written while listening to Endless Light by O’Brother. They appeared in my saved artists list on Spotify recently, already cached to my phone, despite the fact that I have no recollection of ever having heard of them in my life. My assumption I’m somehow sleep-browsing the app and cuing up stuff to listen to when I wake up, because I find new artists this way every day or so. Don’t really care how it happens though if I’m honest, because all of the artists so far have been pretty amazing. O’Brother are probably my favourites so far. Check out their song Slow Sin. My next post will be a review of The Ninja Crusade 2nd Edition by Third Eye Games (the publisher behind AMP and Part-Time Gods). It’s been a long time coming, so I’ll try to get that up in the next week. This entry was posted in Fiction, Reviews and Playtests and tagged Fantasy, Fiction, Jendara Eriksdottir, Pathfinder Tales, Review, Skinwalkers, Starspawn, Wendy N. Wagner. Bookmark the permalink.